If you are on the prowl for a means of storing your weight plates and dumbbells, don't settle for any old rack. The quality of your gym's weight plate rack matters a great deal. If this storage equipment is not high-quality, visually appealing and reliable, members will think less of your fitness center. Let's take a look at some of the best weight plate storage ideas that will keep your weights secured and satisfy your clientele. Take a look at this Olympic A-Frame Plate Tree made by York Barbell and you will immediately desire it for your facility. It has a sleek build that isn't even the slightest bit obtrusive. You can place this weight plate storage device in the corner of your weight room or just about anywhere else. It won't be an encumbrance of any sort. This plate tree weighs a mere 40 pounds. This means anyone can move it from place to place throughout your fitness facility without a problem. It measures 29” in length, 20” in width and 36” in height. Perhaps the Olympic A-Frame Plate Tree's best feature is its design. It is quite compact, preserving your weight room's limited space. Add the fact that it is made by York Barbell, the oldest name in the weight lifting business, it is easy to see why so many gym owners and managers are adding it to their facility. The Olympic plate tree is built with seven pegs that are spaced out quite nicely across the unit. Put your weight plates on this beauty and you won't receive any complaints. 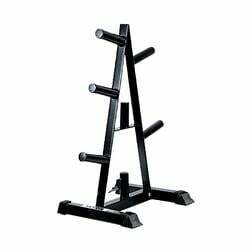 In fact, most members will hold your gym in high regard for adding such an upscale weight holder to the facility. The frame is made of the highest quality 11-gauge steel that comes with a lifetime warranty. There is even a scratch resistant coating to boot so you won't have to worry about your members scraping its sides with weights or other items. This is the weight plat rack of your dreams. If you are looking for a place to store your gym's kettlebells or a high-quality dumbbell storage rack, the Gym Rax Standard Storage Space is the answer. This spacious weight rack stands six feet tall. It is rock-solid, weighing 100 pounds. It is expertly designed to support contemporary training methods of all varieties. Each Gym Rax dumbbell storage rack is made to order. Though this style of production requires about a six week waiting period, the end result is absolutely worth it. A custom configuration serves your nuanced needs down to the very last detail. You will love the fact that this rack can be configured and adjusted in your selected manner. Customization options include the buyer's choice of several different RAX and Wall Bars. It is also possible to connect extra Bays to provide gym owners and managers with a seemingly endless number of storage possibilities. This Gym Rax weight storage unit is made with American steel. Its design includes an embedded microban antimicrobial biologically active coating to keep the rack as clean as possible. The rack even passes through a five stage “green” pre-wash before reaching the market. It features three completely flat trays that are perfect for storing dumbbells, sandbells, kettlebells and other weight-related items that do not roll. It features a lovely snow white color complemented by a gunmetal sparkle that adds the perfect injection of visual pizzazz to your gym. If you decide to purchase one or both of the weight plate storage ideas described above, you might still need one or several more dumbbell storage racks for your facility. The number of weight racks each gym requires is unique to its size, number of weights, type of weights and the nuanced demands of its members. If you are still on the prowl for additional weight plate storage ideas, check out our diverse selection of options. You will surely find something that suits your fancy, holds your weights and pleases your members. We have everything from medicine ball racks to traditional dumbbell racks, fitbell racks, multi-tiered racks, double sided barbell racks, curl bar racks and beyond. Be sure to check out the other categories on our website while shopping for weight plate storage ideas. We carry everything from bath and body care items to fitness equipment, fitness center cleaning supplies, gym wipes to combat the spread of germs and so much more. We have an especially diverse selection of items for fitness facility lobbies, locker rooms, weight rooms and spas. This is your one-stop fitness center shopping headquarters.